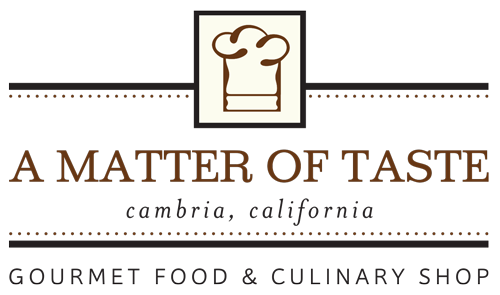 A favorite with our customers is our Soy Candles. They are made with 100% soy wax, all cotton wicks with only high-quality essential and fragrance oils to provide wonderful, unique scents people have come to love. 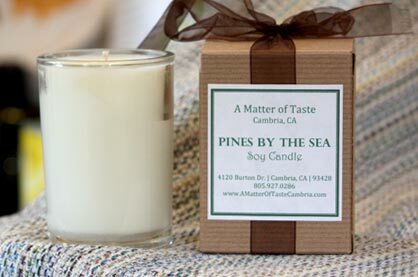 Pines by the Sea – This Cambria scent possesses a blend of spicy evergreen, lavender, amber and pepper, and finishes with a clean mahogany. Cambria Romance – A romantic fragrance composed of sweet bouquet of mandarin orange, bergamot and tangerine enhanced by hints of fresh peaches, strawberries and raspberries on an undertone of white musk. Lemongrass – This pure essential Lemongrass oil has been known to lift the spirits and combat stress. Moonstone – This fragrance is a spicy-sweet blend of French verbena and lemon, a green Florentine iris and violet leaves and sublime notes of Mysore sandalwood and ambergris. Orange Spice – This fragrance is a spicy-sweet blend of orange essential oils, cinnamon bark and Cloves. Simply luscious. Lavender – The pure essential oil used in this candle is known to calm and relax, while filling the room with a wonderful, herbal fragrance. Peace Love & Serenity – An exotic fragrance with citrus top notes of Bergamot surrounded with nuances of freshly ground Ginger combined with Sandalwood, Cedar, Indian Patchouli and Sweet Basil. Bergamot has been known to help w/ anxiety tension and stress. Wild Currant – This crisp and tart fragrance begins with top notes of black and red currants, cassis and strawberries, followed with base notes of oakmoss and musk.